Would you rather avoid the training process? Don’t have the time to train every day? Avoid the guilt! 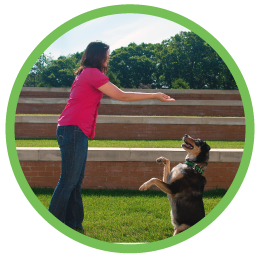 These private dog training packages are tailored for clients who need better behavior from their dog fast, but prefer to leave the all the work to the professionals. We come to you and do all the work in home and around your neighborhood, where you need results the quickest. Don’t spend weeks away from your dog by sending him to a traditional board and train program. You get the practical benefits of having your dog trained where you live AND get to come home to your dog every night! It all starts with a free meet and greet. We want to get to know you and your dog! We’ll come to your home and train for your goals. You receive written and video updates each day to see the progress your pup is making. To show you how to incorporate your dog’s new skills into everyday life. Initial Behavior Consultation | FREE! Our private dog training services are recommended for dogs 21 weeks and older with multiple behavioral problems or fear/aggression issues. Why pay $150, $250 or even more to find out if a private trainer can help you? Our “meet and greet” is free… a no-risk opportunity! We will visit your home and spend time discussing your concerns and observing your dog’s behavior in order to develop a behavior modification plan just for you. The evaluation averages between 45 minutes to one hour. This gives us an opportunity to get to know you and your dog(s), but more importantly, gives you the opportunity to evaluate our training methods, professionalism and capability of meeting your needs. During the FREE Initial Behavior Consultation, we’ll discuss your training goals and offer recommendations on which training package of Follow-Up Consultations (regularly priced $139 each) would be best suited to your goals. Since every dog and situation is different, we’ll write a customized training plan for you and your dog. The behaviors listed for each bundle below are simply examples of what could be accomplished in the number of weeks stated. Just know that your bundle recommendation and training plan will be customized just for you, and we won’t ask our clients to pay for behaviors or extras they don’t need. Every bundle comes with 3 months of phone or email follow-up, as needed. Ideal for Learning Basic Obedience fast! Prefer to do the training yourself? Click here.